One of the BEST things about salads is that they’re simple—but they don’t have to be boring. 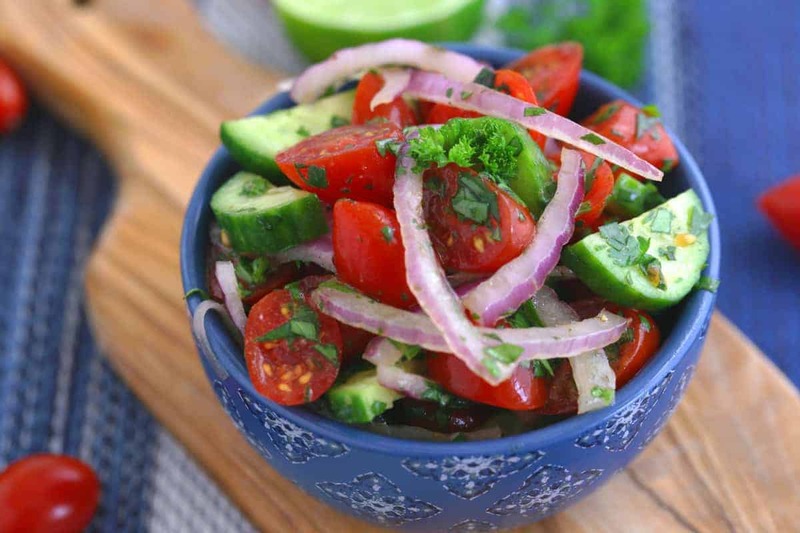 With only a few seasonings and some fresh cilantro, this Indian tomato and onion salad is bursting with fun, fresh flavors. And, it’s even got a satisfying crunch from the cucumber! A deliciously simple side dish, or a quick-and-easy healthy snack that you can whip up in minutes. Or, you can also use this Indian tomato and onion salad as a component in other meals, like a hummus bowl or a vegan Buddha bowl! When I created this recipe, it was as a part of my spicy chickpea Buddha bowl. I love the fresh coolness it brings to the flavorful sauteed spinach and spicy roasted chickpeas in that meal! I definitely recommend checking it out! First of all, if you can’t stand raw leafy greens, you don’t need a bed of greens in your salad! In Indian cuisine, it’s common to serve a bed-less salad with raw veggies like tomato, onion, and cucumber—or sometimes just sliced raw veggies served on a plate for munching! Normally, I am NOT a salad gal because eating raw leafy greens just ain’t my thang… So, this Indian tomato and onion salad is right up my alley, and I still get plenty of wholesome veggies. And, it’s a refreshing, cool element that pairs well with spicier components to temper the heat. But, with just a few seasonings and some fresh cilantro, it’s still bursting with fun, fresh flavors all its own! Add all ingredients to a large mixing bowl and toss to coat. Yields ~1½ cups Indian tomato and onion salad.